Size is one of our main requirements. We want the Exoskeleton to be as slim as possible, so this is true for all the components as well. We want the motor controller to be as small as possible. The motor controller has to work with a brushless DC motor. Two or three absolute encoders need to be connected, this depends on the design of the joint. *We need one encoder for the motor angle, and one for the joint angle. We might implement Series Elastic Actuation in our joint and then we want to be able to measure the deflection in the spring and thus need two encoders for that. While exploring several off-the-shelf possibilities, we came accross the Elmo Gold Twitter(http://www.elmomc.com/products/gold-twitter-servo-drive.htm) and the IOMI Pro(http://granitedevices.com/wiki/IONI_device_model_comparison). One of the problems of these boards, is the amount of absolute encoders that can be connected. Both the Elmo and the IOMI board can either have 1 or no absolute encoders connected. We came op with a solution, so that we are able to connect multiple encoders. In our exoskeleton we are going to use an EtherCAT Master-Slave configuration. The High-Level control (e.g. state-machine) is on the EtherCAT Master and sends joint angle setpoints. 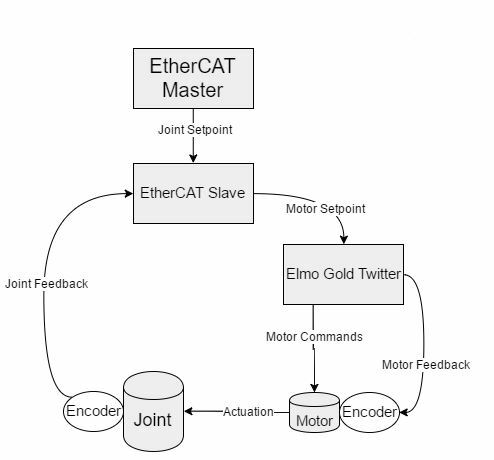 Our idea is to use a EtherCAT Slave as a sort of second controller, which gets the joint setpoint and the joint encoder values, calculates the motor setpoint and sends this out to a certain off-the-shelf controller like the Elmo Gold Twitter or the IOMI Pro. I thank you all in advance for your reply! I am not very knowledgeable about ethercat but I could speculate that the code to manage/run such a system would be relatively simple (measure -> formulate -> actuate). Feedback signals from encoders are also easy to read so I don't see why you can use a simple controller and a custom electronics circuit to drive the motors. This is the only way to keep the size to an absolute minimum. I would also think that the power requirements below are not realistic, you should typically use much much lower wattage system that has an incredibly high gear ratio to give you the torque you need. Otherwise your power bank and electronics power handling requirements would be unrealistic.